Spelt is one of the oldest crops cultivated by mankind – it is actually believed to have first been used around 8,000 years ago! Today, spelt flour is becoming an increasingly popular baking ingredient due to its protein and fiber content. 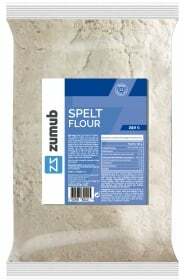 If you are looking for a substitute to traditional white flour, Zumub Spelt Flour is an excellent choice with high quality and a really attractive price! Spelt is closely related to wheat, but it has a slightly sweeter and nuttier taste that makes it an excellent ingredient for making a variety of baked goods. Spelt flour has also been shown to have a higher protein and fiber content compared to ordinary wheat flour. Due to its protein content (100g of Zumub Spelt Flour gives you 17g of protein), spelt flour is also a helpful ally if you are trying to build a lean, toned, and muscular physique – being a great addition to your diet if you follow a physically active life. In addition to its protein and fiber content, spelt has a good amount of vitamins and minerals, such as vitamins from complex B, calcium, magnesium, zinc and manganese, which will contribute to your well-being. Boost the nutritive value of your favorite baked goods and beverages and experience a multitude of benefits at the same time with Zumub Spelt Flour! Have a question about Spelt flour? What is it, what does it do, how and when to use or something else? Ask us. “Spelt flour 500g” is currently out of stock. Enter your details below and we will let you know when it's back in stock. “Spelt flour 1kg” is currently out of stock. Enter your details below and we will let you know when it's back in stock. ALLERGEN INFORMATION: Contains Gluten,May contain allergens handled in the production facilities, such as other cereals containing gluten, milk, lactose, soy or nuts. Use as a substitute for regular flours, to prepare pancakes, crepes, cakes and desserts. Use for pie, pizza or bread dough, or add to smoothies. WARNINGS Spelt flour : Keep out of reach of children. This product should not be used as a substitute for a varied and balanced diet & healthy lifestyle. This product should not be used in case of hypersensitivity or allergy to any of its constituents. Store in a cool, dry place. BEST BEFORE: Please see lot number and expiration date stamped on the packaging.